R. Baron Designs: Welcome to the 8th Annual Bead Soup Blog Party! Welcome to the 8th Annual Bead Soup Blog Party! The 8th Annual Bead Soup Blog Party starts today! 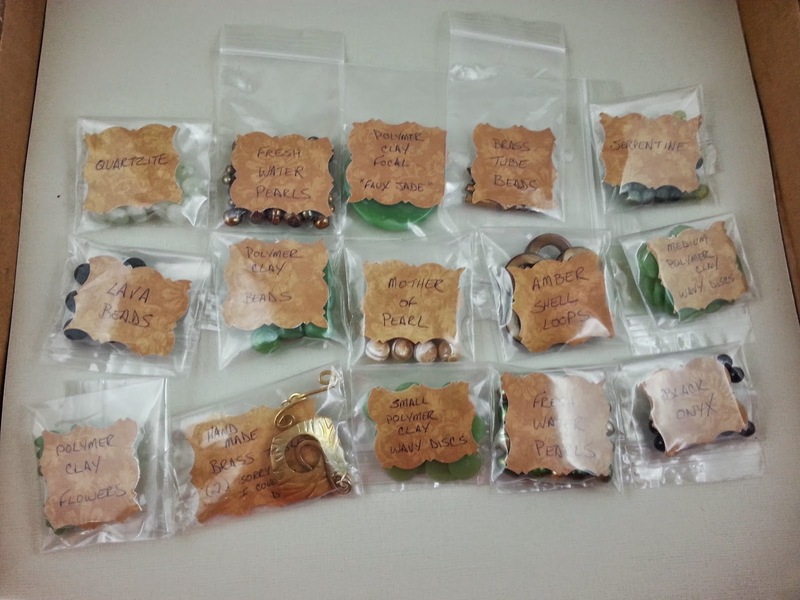 She sent me tons of natural materials to complement her polymer clay; mother of pearl beads, black onyx, pearls, lava beads, shell hoops, serpentine and more! My original "plan" was to use the focal and handmade brass clasp (she sent two!) in a single piece. But my muse wasn't having it...so I grabbed one of my more neutral lampwork focals, and started adding some clay disks...pearls...onyx...mother of pearl beads...and came up with a cool necklace I love! And here's a photo that shows the neat clasp and the colors a bit better! Next, I had to do justice to the amazing clay focal Pat sent me. It looks like real Jade--I couldn't have guessed it was clay by looking at it! I knew the focal was so gorgeous, it shouldn't have too much to compete with it. I decided to make the focal a pendant on a simple silver curb chain, and added some dangles made out of more polymer clay flowers Pat sent. I just love this necklace, too! And a closer pic of the amazing focal! Finally a made a pair of earrings with the shell hoops and the lava beads. I love the look of lava beads, so I had to make *something* with them, even if it was just earrings! So much natural beauty! I didn't even use all the beads Pat sent, she was so generous with her soup! Please make sure to check out her Blog, so you can see what she made with the soup I sent! Now sit, back and relax, and have hopping the rest of this amazing group, and be sure to visit our Hostess, Lori Anderson first! Click on the link below to see the complete list! <3 the green with the pearls! Well done, indeed! I love love love the second necklace and the earrings. very elegant and inventive projects!congrats! The focal does look like jade. very pretty and you did it justice with your design too. Well done! Beautiful designs. I love what you did with the "jade" pendant. It was seriously fun playing with the soup that you sent me. Pat, the more I look at the first necklace to more I love it, too! It's just so fun and so much natural goodness--thanks to you! Love the jade necklace! Great soup! Wow - absolutely gorgeous! I love that green focal necklace with the dangles. Yum! Very pretty. I really like the green necklace, the focal looks a lot like jade. Beautiful necklaces and I like the earrings too! All are very pretty, but the green necklace really speaks to me! I love all of these, the colors just pop ! That focal is pretty cool. Great job with a wonderful soup! Lovely job with your soup! I love what you've done with that wonderful focal. Works beautifully, so delicate and pretty! Wonderful makes all round. I love green mixed with the pearls and black beads ,beautiful . Your muse was spot on. That 2nd necklace is just awesome. I love it! Lovely pieces, especially the necklace with the green focal. The simple elegance of the first piece is superb, but you really did manage to do justice to the pc jade! I love what you did with the focal. So simple and so beautiful. Wow that is an amazing focal and I like that you kept the design simple with the necklace and the earrings. You've created some beautiful pieces with your soup. I love how you were so creative with your focal bead on your second necklace, simple yet elegant - Cheers! I love that you chose simple settings to show off Pat's beads. It's a wise person who knows when something needs that simplicity. And you still have lots of beads to use in other things. I call this a win! What an amazing soup you had to work with. Fabulous creations! Really Soup-er! The faux jade piece is absolutely breathtaking. Great designs! Love the jade necklace and you are right, it looks like real jade! Great job! What a great soup to start you off! I love that first necklace and the faux jade necklace is lovely too well done! Those are gorgeous pieces! I especially love that second necklace, with those green dangles --you complimented the focal beautifully! Lovely soup ingredients - and you did it justice: beautiful necklaces: love the feel of them, and the dangles complementing the focal. I hear you about those earrings - lava beads are beautiful! lovely soup , amazing finished pieces. Love the dangles with the focal pendant .you're right it's gorgeous and looks like the real thing. Love the colours you used in the pearl necklace ,such soft subtle colours you can wear with a lot of outfits. Lovely soup and wonderful finished pieces! I really love how you complimented the soup focal with the disc beads and the dangling flowers... beautiful! First off, those are definitely not *just* earrings. They are lovely in a classic and understated way. A very versatile design. The rest of your designs are wonderful as well. Great work. All of these pieces are lovely. Enjoyed looking at them. Simply lovely! I love the dangly flowers! I love the focal on that necklace with the dangly flowers. Great job!!! I really enjoyed your pieces. They are fresh and different. Great job. The green one speaks to me. Both pieces are great but I am drawn to the green faux jade I like the simplicity. Wow, your pieces made out of your soup are just beautiful, I am still drooling. Lovely designs and that focal is awesome for sure! Lovely and the focal piece is something you could wear almost everyday. Beautiful! You've made some really elegant pieces! Great work! Really love the simple necklace the best! good job! Lovely, lovely pieces and I especially like the simple elegance of the focal suspended on the silver chain. Excellent work! Very pretty pieces. The clay discs in the first necklace really make it a stand out piece! Great pieces, I love the natural and the polymer mixed with the chain. All your creations are elegant and beautiful. Rich soup and great designs! green necklace is my favorite! Beautiful work! Gorgeous! As much I love the focal in the second necklace, the first one steals my heart. Those clay discs really make it a unique and beautiful design. Beautiful pieces! I love the color and flow...excellent job with your soup! The first necklace is pretty. WOW!!! that focal is gorgeous and I really like the wavy discs and flowers too.. Good job Rachel. Your second necklace is very pretty. I like your other pieces too, but that particular one grabbed my attention. The focal is kind of dreamy. Great designs, indeed the focal is so beautiful and well made, I love the way you used it! But My favorite is the first necklace, it is so perfect, with the color combination an the focal and all! Great work! Really great work. I can't decide on a favorite, but I do love the way the little green flowers hang around that great focal. I love all your designs but the green focal with the flowers hanging around it is really pretty. It's simple but eye-catching. You did a beautiful job with your soup!!! I love the necklace you made with the clay focal that looks like jade. Very nice! I like all of your designs. Beautiful!!! Have a Blessed Day! Rachel, I love how you incorporated the discs with your lampwork.. Special pieces from a special soup! That last necklace is my favorite! The focal is stunning and you did a beautiful job with it. All are beautiful designs but the faux jade necklace is stunning. Your designs are really lovely, especially the necklace with the clay focal. She really did make a stunning pendant, but your design absolutely sets it off perfectly! Well done ! I love polymer clay !! You did very well with your bead soup ! Love that polymer clay focal ! Whow! Great work! I love the necklace with the green focal! Gorgeous soup ingredients and beautiful designs, Rachel :) I agree that faux jade is sublime! wow, i can't believe that focal is clay either. You did a great job showing it off! Very pretty pieces! I love the colour combinations! I think all your designs are beautiful! You've chosen the beads and Findings very carefully and everything looks so harmonious! The "Jade" focal necklace is my favorite!